Summary: Partly Cloudy. High 48*. 0% Chance of Rain. Winds N 6 MPH. 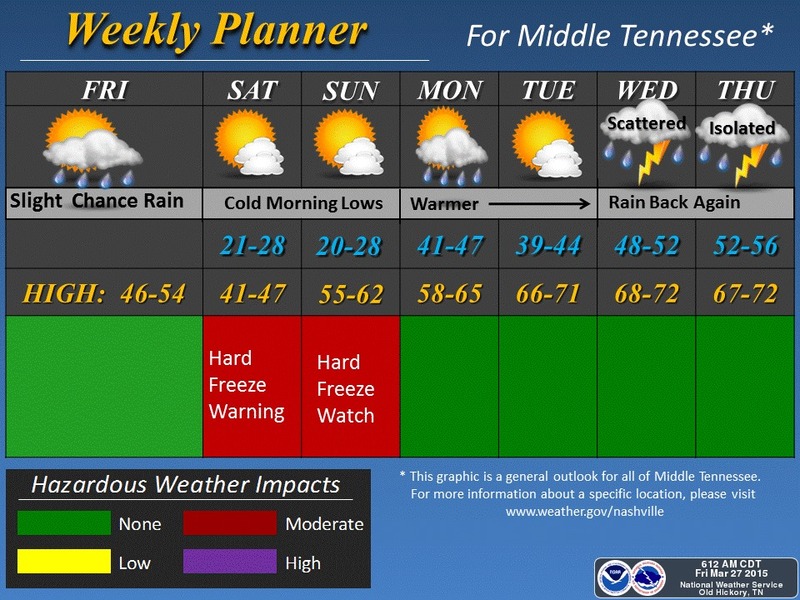 Hard Freeze Warning and Watch. We are waking up to freezing temps on this Saturday morning. Currently we are under a HARD FREEZE WARNING until 10am this morning. Our high will reach about 48 degrees today, and we should see any rain (or sleet, or snow….) like yesterday. It’s going to be a chilly day, made worse by a wind straight out of the north at 6 MPH. I hope you didn’t put those winter clothes up too soon. (On another note, a couple of weeks ago 48 degrees felt like a heat wave… but I guess we have transitioned into spring now huh?). Don’t uncover those sensitive plants just yet, because…. Tonight: Lows below freezing again: 24 degrees. A HARD FREEZE WATCH. 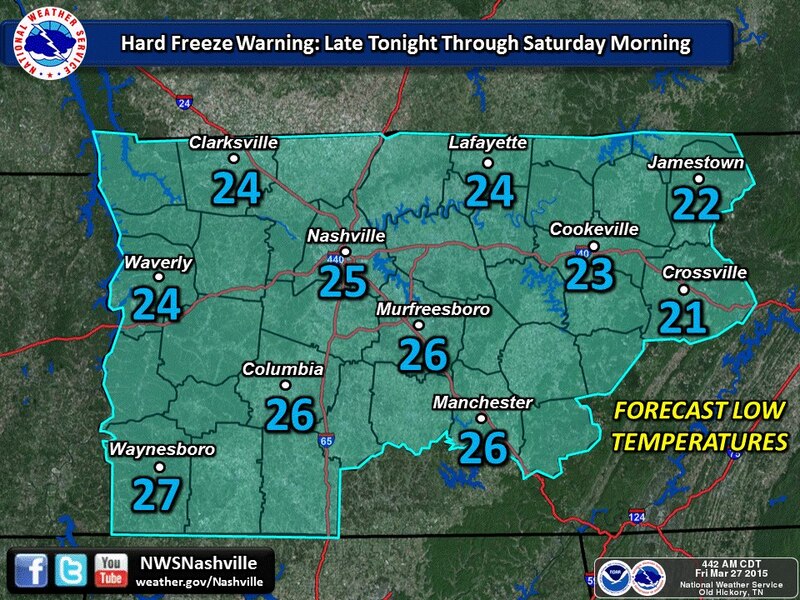 NWSNashville is putting us back under a HARD FREEZE WATCH tonight as well (likely to be a warning) due to the low temps. Any plants will likely suffer greatly or even die if they are sensitive to cold temps. Winds will be light and variable, but coming out of the ENE. Extended: Gradual warm-up starting with Sunday. Thunderstorms to end the workweek. Sunday thankfully is warmer with a quick warm-up into the low 60s. And the best news: it doesn’t look like the temperature will bottom out at night in the freezing mark! The work week starts pleasant as Monday and Tuesday look dry. We are looking into a rain maker coming in the later part of the week which could start Wednesday. Most of the rain appears to be Thursday though, as thunderstorms are forecasted. It’s too far out to tell if these will be severe or not, but rest assured we will keep our eye on it.